Not a bike yet, but near the top of the queue to be built, all parts in hand! 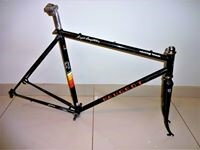 Peugeot Carbolite 103 "Racing Team" model - the first and only example of these frames I have ever found in my size - I've had five or six pass through my hands over the years, all in 24" size! Build will be mainly French vintage Huret Rival gears, Mafac brakes, Mavic rims on Maillard hubs, Michelin tyres, Lyotard pedals and so on. This will be a rider, with mudguards, rack and panniers and wide range 12 speed gearing - at least that's the plan! Willpost photos when finished.